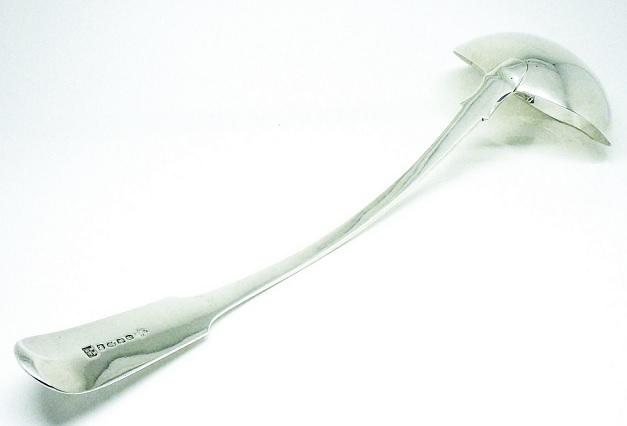 Tablespoons - 8 1/2" (21.5cm) in length. Old English pattern. Assayed at York in 1815. James Barber was joined in partnership by William Whitwell in 1814. Barber's previous partner, Robert Cattle, had left the business by mutual consent on the 1st January 1814, to take charge of the mails and the post-horses at the York Tavern. Whitwell had been working as an assistant with the firm for many years. The partnership was ended by the death of William Whitwell on the 24th April 1823, he was aged just 36 years. Do you know why that York pieces so rarely feature the town mark, outside of commissioned pieces such as those made for the Yorkshire Club where it seems to have been added by special request. It's an interesting question. I'm not aware of any 'official' reason as to why the York town mark was so rarely used on smaller items, but I can think of at least a couple reasons why these pieces lack it. 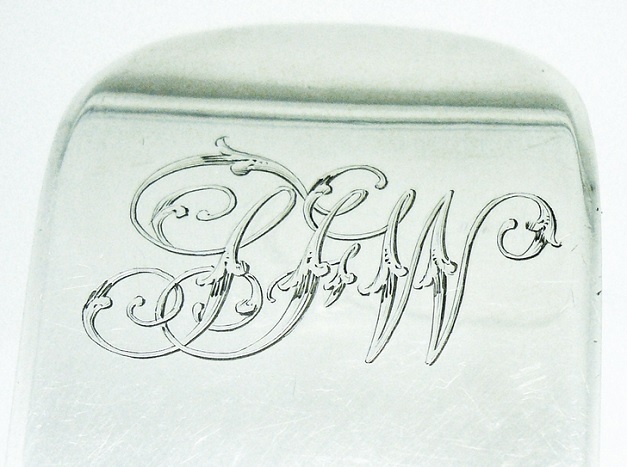 It was perhaps considered excessive for smaller items to be struck with six marks, it is to be remembered that with every striking of a mark, damage occurs to the item, which has to be corrected by the silversmith upon their return, the smaller the item, the more damage would have been done (there was much grumbling in the trade during the period of double duty marking) and more effort on the part of the silversmith to put things right. On small items the profit is perhaps minimal and time spent refinishing items resented. The larger the punch, the more force required to make an impression. Although it does not show up well in these images, the cross is surrounded by a circular cartouche. 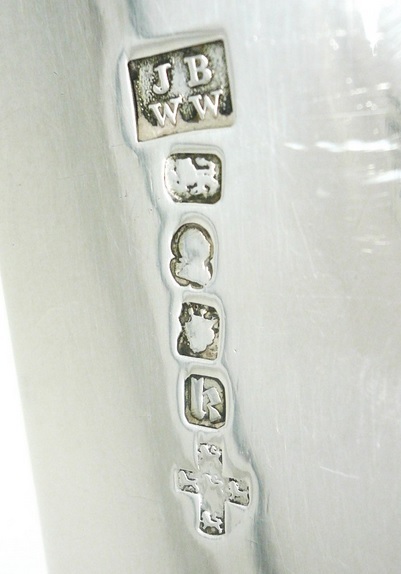 It may well have difficult to make smaller town mark punches at this time, to get the detail of five lion passants into the punch must have challenging to the engraver. This punch may well have been the most costly to produce and consequently its use minimised to spare expense. Just thoughts, and it would be good to hear the thoughts of others. What you say would certainly make sense. 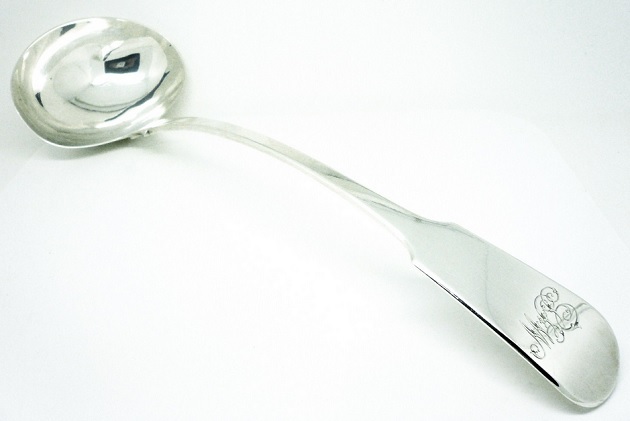 However just a thought, York silver is generally sought after due to its relative scarcity, I wonder if this was the case when it was first made. If so you would imagine it would be in the makers interest to add the town mark, to more easily distinguish its origins, as even now it is fairly easy for the layman to assume it is a London mark if the York town mark is absent. I would have said the opposite, anything London-made at this time was held in the highest esteem, especially where silver is concerned. Provincial made items, often unfairly, were considered second best. 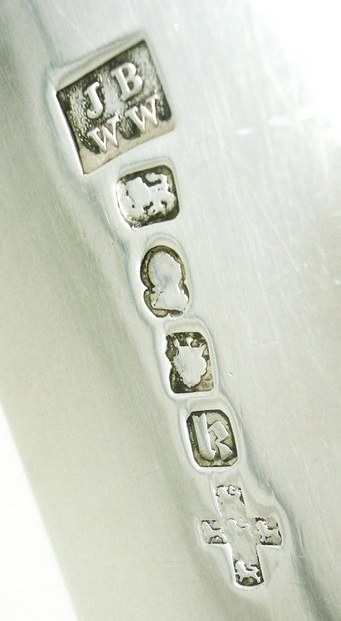 However, a lot of silver that is York marked was in fact London-made. I hope this doesn't shatter an illusion, but from the time of Barber & Whitewell, the firm were being supplied by Emes & Barnard, later, Edward Barnard & Sons at least, and perhaps by others, with unmarked items. Again that makes perfect sense. I wonder though why the same mentality didn't apply to somewhere like Newcastle, I have seen many pieces from there during this period where the leopards head has been omitted, but the Newcastle town mark is invariably struck.